The AGSteam plugin serves as an intermediary step between the Steamworks API and the AGS runtime engine. In short, what that means for you is that if you're working on integrating a game into Steam, you can now place Steam-related function calls directly in your AGS code! Currently the plugin supports Steam achievements, int, float, average rate stats, global int and float stats, and leaderboards. If you need any other Steam features, let me know and I can explore options to get them working properly for you. Update: I've determined that the usage of the Steamworks API does not violate the non-disclosure agreement with Valve. AGSteam is now open-source! Note: This plugin will not make Valve accept your game for Steam integration. They still hold the sole hand in that decision. This plugin will not do you any good if your game has not already been accepted for the integration process. This is fantastic, monkey, also USELESS to me. But we'll see. Fantastic step forward there, Monkey! Well Dual and abstauber, if you would take adventure game creation seriously then maybe Steam would accept your games. @Calin: Maybe you missed it in my first post, but Valve has a pretty strict license on the Steamworks API. Without access to that the source for this plugin would be pretty useless. It wouldn't compile, and would be barely anything more than the existing AGS Run-time Plugin API. That's why I chose to just make the whole thing closed-source. That and it prevents any issues arising from inappropriate use of my source code in relation to the Steamworks API. Perhaps I'm being a bit overdramatic or overprotective, but the reason I'm not releasing any part of the source for this is to protect myself. I hope everyone can understand that. If any serious programmers would be willing to (physically) sign a(n) NDA with Valve, then I (acting as MonkeyMoto Productions, Inc.) would be willing to provide access (with you as an "employee" of MonkeyMoto), provided that a Valve contact could confirm that such a business relationship would be allowed. @tzachs, I'm sure that if you really set your heart to it you could make something that Valve would accept without second thought. And glad to hear the general cry of approval even though (at the moment, at least) the true viable usefulness of this is abysmally low. I dont see why we cant see how the plugin has been implemented. Sure it wont build but for educational purposes, I cant see how it would hurt. Just dont release the steam headers and any closed code. Geez, Calin, are you trying to get monkey into trouble? His first post says that Valve want to keep the API proprietary. Even if monkey technically doesn't break the NDA, Valve might decide he's not acting in good faith and you can imagine the consequences. Gemini Rue taken off Steam for example. Congrats on getting this done by the way monkey! I find that *incredibly* unlikely. And releasing *your own* code for educational purposes cannot break any license. I specifically said that he shouldnt release Valve's code but releasing his own is neither here nor there. If you're that interested Calin, just check out whatever documentation Valve offers publicly regarding the Steamworks API. The plugin uses a lot of copypasta in that regard. Actually it's a bit more complicated than that, but you'd get the basic idea. I used the AGSE_FINALSCREENDRAW event in place of a proper main game loop. It polls often enough for my purposes. If I use this plugin, does it mean I have to close the source to games I (attempt to) release on Steam? 1) The plugin is closed-source, that does not mean games made with it have to be. The AGSteam API is publicly available. 2) This plugin does not provide any immediate support for multiplayer functionality, although if you ping and set int/float stats...I suppose it might be perfectly possible to use it that way. 3) I need to update the first post with the Blackwell games - getting on that now! Not immediately supported but doable...that's exactly what I wanted What fun would it be if everything I wanted was already there? I'll see what I can do with this over the course of tonight, I'll report back when I have results. For the record, unless you already have had at least one game accepted by Steam, then you wouldn't be able to use the plugin, even for testing purposes, as it specifically uses the Steam API for all of it's connections. This plugin really is quite simple internally, but the reason it was written was to provide a generic intermediary between the C++ Steam API and AGScript in your games. Without such a mechanism it would otherwise be requisite to write a custom plugin or engine build for each game you wanted to integrate with Steam. With this plugin however, Dave Gilbert was able to integrate the Blackwell games without having to write any C++. So, for those who haven't heard yet, Gemini Rue is now available on Steam! They're even running a special discounted price in celebration of the fact. Why am I bringing this up? Because Gemini Rue has been brought to Steam courtesy of the AGSteam plugin for AGS. What is this AGSteam plugin? I'm glad you asked! It's certainly not Nimbus if that's what you're thinking! The AGSteam plugin serves as an intermediary step between the Steam API and the AGS Run-time. In short, what that means for you is that if you're working on integrating a game into Steam, you can now place Steam-related function calls directly in your AGS code! Currently the plugin supports Steam achievements, and float and int stats. If you need average rate stats (or any other Steam features), let me know and I can explore options to get them working properly for you. I'm not entirely sure how useful this will be for the community at large, but if you do get your game accepted for Steam integration and want to use this plugin, please let me know! I'll even keep a list of games that use it as an additional publicity measure! NOTE: This also relies on the redistributable "steam_api.dll" (which is publicly available as part of the Steam client installation). I'm not going to get into the logistics of bundling that, even though it's publicly available. Just be aware you will need to place both DLLs in your editor folder, and manually copy the steam_api.dll to your Compiled folder (the AGSteam.dll will be automatically copied on compile). NOTE: (20 August 2012) The version which is currently uploaded is rather badly bugged, which didn't manifest until some changes in the Steam API. I have put a lot of the leg-work into developing a better version of this plugin, but due to the fact that it wasn't needed, I never fully cleaned it up to the point that I'm going to be uploading it in the near future (basically read as: I didn't type up documentation for the revisions...). I believe that I made the fixed version backwards-compatible with the current version, so you should be able to grab it from any of the Steam games listed above (or ask Dave (or anyone who has the games, geeze!) to send you a copy of the DLL). The link provided in that post isn't working, is there a mirror somewhere? I'd love to use this in my Adventure Game that I want to put on steam after completion. Is there a way to detect if the steam overlay is open? I'd like to pause the game when that happens, since right now the game responds to mouse clicks and keyboard input when I chat with a friend using the overlay. *edit Not to mention, the overlay can be disabled altogether in the game options in steam too. The Steam overlay has been one of our biggest issues so far (third only to save game compatibility on updates and the inability to change resolution from within the game). AGS games react in really unpredictable ways when the overlay is activated. The game freezes, or dialog zooms by really fast, or any number of things. My theory, and it's only a theory, is that you are running the game natively in a very small resolution? The overlay is in a higher resolution, so displaying both at the same time tends to have unpredictable results. I've noticed that the higher resolution I run a game in (using the "max nearest neighbor filter" in the later versions of AGS) the fewer problems there are. As for pausing the game when the overlay is active, I am unsure! It pauses fine when I use the overlay, but as I said the results tend to be unpredictable. I added this when working on Al Emmo. I don't recall if Chris said this definitely fixed everything, but it attempts to force the engine to ignore the Steam overlay being opened and closed. As I recall, that seemed to be enough to stop AGS from going crazy in the background. If not, then I might consider having the plugin keep track of whether the overlay is open, but I was afraid of that somehow getting out of sync and causing worse problems. Just to be sure, you are using the latest version of the plugin linked in the first post? P.S. As you obviously are a Steam developer, I could give you access to the full source code of the plugin if needed. My adventure game, Absent, was released on Steam recently! Any chance you could add that one to the list on the front page? I've updated the games' credits and put you in there for designing the plugin too. Thanks a ton for the source code, it has saved so much time on my end! If i understood, i don't have to write nothing in the code of my game only copy and paste the .dll library in the main proyect folder, ¿that's correct?. I am hearing of new issues with our game, in places where it has worked fine previously on Linux - is it possible the .so files are out of date compared to latest versions of Linux? Not knowing how Linux stuff really goes, thats the best I can come up with.. Sorry for the unresponsiveness folks. Latest binaries are up with some significant changes. AGSteam now supports unified builds by default (agsteam.dll). If you want to continue using the Steam-specific struct name of "AGSteam" in your game scripts, feel free to use the "disjoint" plugin (agsteam-disjoint.dll) instead. All this really changes is how you call the Steam functions, but the two versions (unified and disjoint) generally shouldn't be used together (theoretically they won't conflict, but there's just no reason to have both since they do the same thing). Where "ACHIEVEMENT_01" is the API name of your achievement (as set up on the Steamworks backend website). This is how Steam knows that the achievement has been unlocked. You would call this function whenever the player triggers the action that unlocks the achievement. @Mark: Not sure, I'll look into it. I know Linux has been an on-going issue for you. I will contact you. Some of my users (others have no problems) get this, being unable to run the game at all. I'm using the AGSSteam Plugin only (Windows), any thoughts? It's driving me crazy. I'm wondering if i should grab this https://bitbucket.org/monkey0506/ags2client/downloads "AGSteam"
Forgot to say that, the users having the problem are all on Windows, some even have the same exact Windows I'm using, and the issue happens regardless of whether Steam is up and running, or even installed at all. I run the game perfectly fine with Steam closed. I think it's probably this problem. Unfortunately there's no way for the plugin to know which version(s) of the Visual C++ Runtime any given user may have installed, though the engine itself does currently rely on the VC++2008 32-bit Runtime, so that probably would be the safest bet. I will take a look at recompiling all 6 plugins (AGSteam, AGSteamStub, AGSGalaxy, plus the "disjoint" builds of each) later today (hopefully) with VS2008 instead of VS2015. Hi. Are Steam Achievements one time thing or do i need to supply them with extra variables to ensure that they are triggered only once ? Well a function-local variable would always be reset every time the function is called anyway. Then whenever you call GiveScore and the score exceeds or equals 100, the achievement is set, without having to poll for it every single game loop. Thanks for the help monkey0506. That will save me from creating unnecessary variables. I have already tons of them and i wouldn't want to add any if it isn't absolutely necessary. At last i'll use the plugin to insert achievement. But i have a question. Wich plugin of the list i have to download to use it?. RESOLVED - I MANAGED TO WORK THIS OUT. I missed a checkbox when setting the game up on Steamworks. Any help is much appreciated! I've looked through the forum and seen that it could be an issue with DLL conflicts or Visual C++ Redistributable for Visual Studio 2015. Do you know if this is the case? shaun9991, the error itself means that the AGS2Client plugin was not able to load (hence the game cannot use its script commands). The question is why it happened. I would try to find out whether this plugin has any dependencies, like particular VisualC redistributable package has to be installed. EDIT: Well, I could not find such information anywhere in this thread, or AGSClient thread (although maybe I missed it, a lot of text there). However, since you know which plugin dll you are using, you can use dependency walker utility to find out which libraries it requires. Or tell us where we may download the plugin DLL, so that we could investigate. From personal tests, it's the redistributables. I had my game installed on various OS and when i managed to replicate the problem, it was solved by installing VC libraries. Hi guys, thanks for your messages. When I initally released the game on Steam, I had overlooked the fact that I needed to include VC redistributables. When I fixed this it solved 90% of the problems, however, some people are still reporting the same error, and a couple have reported this error: "The program can't start because api-ms-win-crt-runtime-|1-1-0.dll is missing from your computer. Try Reinstalling the program to fix this Problem"
I've packaged the game to automatically download VC2015 and 2008, as well as the latest .NET framework. Is there some other redistributables I should be including here? I ran it through the Dependency checker but I'm not too sure what I'm doing... any help much appreciated! I really think plugin author (monkey0506) must specify those requirements, because he should know better what did he use to compile them with. According to what I find in the web, "140" is a version of Visual C 2015. So they probably need that. There may also be the problem, though, that there are different "sub-versions" of VC2015. At least that was true for VC2008 which is required for AGS Editor: we found that not very VC2008 matches, but one very precise package version, which we now include into AGS installer. If you won't be able to find out why people who have VC2015 installed still cannot run the game, you may try following solution: uninstall all the visual C redistributables you have on system and reinstall them again step by step, checking whether your game works. Of course, it is safer to do things like that on virtual machine, if you can make one. Hello! I'm in the progress of releasing a Linux version of Heroine's Quest, and I'm having some trouble getting achievements to work. I've just downloaded the 64-bit plugin from the link above since that's a newer version, but it turns out the 32-bit link above is a 404. Can someone help please? (edit) ok, I've found the file. ERROR: ld.so: object '/export/disk1/home/username/.local/share/Steam/ubuntu12_32/gameoverlayrenderer.so' from LD_PRELOAD cannot be preloaded (wrong ELF class: ELFCLASS32): ignored. Sorry to necropost. I'm finding a number of users are complaining about the same issue Radiant reported. I usually have to send them a non-Steam build so they can run the game. Did anyone uncover a fix for this? The old link to MS Visual Studio 2015 seems to be broken now. You do not need Visual Studio, you need Visual C++ 2015 Redistributable libraries. or at least that is what I found last time. Also, do you mean they have problem on Linux or Windows (or Wine under Linux)? It was windows. Thanks CW! I'll pass this link on and see if it works. Huh. For some users it worked. For some users it didn't. Is there anything else that could be causing this? edit: I've given Monkey0506 a poke on facebook about these issues and hopefully he will respond! Could you tell what exactly is happening? People were mentioning couple of different errors above (and Radiant you referred to was speaking about Linux port). It's specifically for Windows, and they receive the error "Script link failed: Runtime error: unresolved import 'AGSteam::SetAchievementAchieved^1'"
(and Radiant you referred to was speaking about Linux port). Yes, I don't recall any reports about this happening on Windows. It's happened to about 5 of my testers so far, all Windows users. Well, I'd be surprised if it's overlooked by you, but is agsteam.dll (and steam_api.dll) in your compiled game folder Dave? Without it windows users will get this error. You can remove either dll from a compiled game folder and you get exactly this error. If they're testing through Steam, have them verify game files (and confirm the dll is in their game folder with the EXE) and make sure you've got the dll's included in your depot! Having both these files, but getting the error, is pretty much confied to Linux, because it's the "libraries". In some instances you can grab libraries from any of your older Linux game builds and copy them over and they might work. Maybe that necessity of updating the actual libraries has crossed over into windows territory and dll's now, I don't know whether they need to be updated. But you may be able to grab the 2 dll's from an older game of yours that used them and try those (for Windows testers)? I've updated the Windows DLL downloads for AGSteam to avoid the need for any particular C++ runtime to be installed, which was an oversight on my part in the first place. Will work on updating other download links. Sorry for the confusion. To be clear, if you're replacing "agsteam.dll" from a game which uses "AGSteam" in the game scripts (e.g., AGSteam.SetAchievementAchieved(...)), then make sure to grab the AGSteam-disjoint.dll and rename it to "agsteam.dll". I didn't get this comment. What's the non-disjoint alternative then? Sorry for the confusion. The AGSteam plugin now uses the AGS2Client interface. To make building for multiple clients (e.g., both Steam and GOG Galaxy) simpler, I replaced the game script struct "AGSteam" with "AGS2Client" in both the AGSteam and AGSGalaxy plugins. You would just toggle the active plugin and hit rebuild. Hopefully that makes sense. The "disjoint" builds preserve the client-specific names ("AGSteam" and "AGSGalaxy") in the scripts, so if your game already depends on those scripts you can use the disjoint build of the plugin. And m0ds: yep the files are in the compiled game folder. If that weren't the case, then NOBODY would be able to run the game via Steam at all. Yup. Renamed the project where the downloads were hosted and forgot to update the links. Editing now. OK got one confirmation from someone who couldn't get it to work before. It now works for her! It turns out that earlier versions of the AGSteam plugin support the function GetCurrentGameLanguage, and the current one does not. Could you check if you can put this back in please? Also, one user reports that the plugin causes a crash when the game starts up, causing AGS to abort with a nullpointer exception. Since this isn't happening to other people (to my knowledge) this is probably due to his system setup. Still, perhaps you have an idea what could cause this, and maybe this can be fixed with clever usage of try/catch blocks? There was an issue reported by Dave Gilbert that has been patched in this version, but I got distracted before I updated links and such. This is only the "unified" build (use "AGS2Client.Function()" instead of "AGSteam.Function()"), but I can make sure that the "disjoint" build is uploaded as well in case you're using that. The issue Dave reported may have been the same one regarding a null pointer, which would occur if Steam failed to initialize (namely, if Steam wasn't running). I will make sure that GetCurrentGameLanguage is added back to the plugin(s). Edit: As of this writing, I am uploading the latest builds, which have GetCurrentGameLanguage added back in. Thank you. I would like to keep using the disjoint build for Heroine's Quest but will use the unified build in upcoming games. Ok, so using the unified build, one particular user gets this error when the game starts: "An exception 0xC0000005 occurred in ACWIN.EXE at EIP = 0x1000122C ; program pointer is -23, ACI version 3.3.0.1162, gtags (0,0)" Now it works fine on my system (even when not logged in to Steam), but apparently on his system something is failing to initialize and causing a nullpointer exception. His system doesn't have Steam though. Do you have an idea what may cause this? From what CW has said in your other thread, "program pointer is -23" would indicate that the plugin has already initialized. AGS2Client::GetClient() returns a pointer, but it is a statically allocated object, much the same as AGS2ClientStub's implementation (which, incidentally, I realize the function name I just linked to was not renamed, though that's completely inconsequential). There is no possibility that the plugin's initialization is dereferencing a null pointer (short of physical memory corruption or the ilk). All other plugin functions should be checking that Steam was initialized before they do anything. Otherwise they should all be no-ops, the same as the stub. Is it possible to test this with a newer AGS engine and see if similar results occur? Even without Steam running (at all), I can't reproduce this. Radiant, I forgot to ask last time, but can user send you crash dump? The version of AGS used is several years old, it might be some error there that was since fixed. Also, I wonder if this error may occur if some DLL failed to load again. Yeah, sorry. I've asked the player to re-upload it and now I can download it from that same link. I would need corresponding exe to be certain, but from the limited info I could get from the dump, the exception occured in AGSSteam.dll. Since I do not have its sources or PDBs, I am unable to diagnose this further myself. According to the dump, AGSSteam.dll and steam_api.dll were loaded at the time this happened. I could only confirm the location indicated by EIP number: the exception occurs at the time plugin's "engineStartup" function is called, which is before any script is run. After doing some research into Steamworks.NET, I've determined with reasonable certainty that the AGSteam usage of the Steamworks API does not, in fact, breach the non-disclosure agreement with Valve. Or, in any case, the mere existence of a project like Steamworks.NET has brought the relevant information into public domain through no fault of my own, which is all that I agreed to in the NDA anyway. As such, AGSteam is now open-source. Hopefully this will help track down the problem, because as I said, I can't seem to reproduce it myself. Hopefully this will help track down the problem, because as I said, I can't seem to reproduce it myself. Well, so far the issue occurs only on one guy's computer; I cannot reproduce it myself either. We do have the .dmp file but other than that I don't really know where to go from here. Suggestions welcome. I never really learned how to use these DMP files, so I'm not particularly sure myself. Hopefully CW has the time and ability to look into it or help explain the steps needed to proceed. I believe the .dmp file is essentially a stack trace. Given either the application's source code or a debug build (or a .pdb file that contains line number info) of both the .EXE and the .DLL it should be possible to pinpoint which function (or even which line number) caused this nullpointer exception. CW's earlier post suggests it's inside the DLL's engineStartup function. I'm going to assume that calls AGSteamPlugin::Startup, which calls AGSteamPlugin_Initialize, which makes three calls to the Steam API, i.e. SteamAPI_Init(), GetListener(), and RequestCurrentStats(). Maybe one of these three functions causes an issue, and adding a try/catch block in SteamAPI_Init could help locate this. Something else that may be worth checking is whether steam_api.dll is outdated; apparently this is version 3.92.72.58 which has a copyright stamp of 2007. Looking over my Steam library I find numerous versions of this file, but none with a higher version number, and they all have (c) 2007. Dereferencing a null pointer won't actually throw a C++ exception, so a try/catch block wouldn't help. Just over a month ago, Steamworks v1.41 was released, while the steam_api.dll included in the latest build is from v1.40, but there is no reason to suppose that this would cause such a failure (Valve expressly states that there is no requirement to upgrade). Keeping a C/C++ assembly's version information up-to-date is actually far less common than you might expect. Valve just hasn't bothered with it. The steam_api.dll I have bundled is from Steamworks v1.40, only one version behind the latest release. Dereferencing a null pointer won't actually throw a C++ exception, so a try/catch block wouldn't help. Well I did try loading the dump file he uploaded, but Visual Studio just reports that it can't find AGSteam.dll. I have tried browsing to the file (both the unified DLL and the disjoint DLL, including renaming the DLL), but the "Open" dialog just doesn't do anything, while in the background under "Binary load information" it keeps appending the message "Can't find or open the PDB file. ", despite the two files being in the same location. Perhaps it's something to do with the PDB being out of date with the DLL the game EXE was referencing, but I didn't think DLLs worked that way. I'll make a debug build (with logging, as you requested) and upload the DLL and the PDB file. Edit: You can try this build (rename "AGSteam-disjoint.dll" to "AGSteam.dll") (deleted, see new link in following post) and see what results you get. I tested this with AGS 3.3.0 Final "Default Game" and got no problems, with and without Steam running (obviously, without Steam running the plugin simply did not initialize). I downloaded the EXE you posted above (understanding, of course, that it's not the full game and won't be playable), and it raised some questions. * Heroine's Quest is still using the "disjoint" build, isn't it? You referenced using "AGS2Client" above. The EXE you posted definitely is using the disjoint build, in any case. * Was Heroine's Quest rebuilt against this version of the plugin? The EXE you uploaded is looking for "AGSteam::FindLeaderboard^1" which was replaced almost two years ago. I had to inject it back in as a reference to RequestLeaderboard with defaulted parameters. * Is this the same version of the game that's on Steam? I am installing the game now to do some more testing, but I wanted to confirm if it is indeed the same version. Even before I reinjected FindLeaderboard, the Steamworks API was definitely initializing successfully before the game totally crashed out, as evidenced by the log file. I deleted the log file a few times to be sure. The long and short of the reply I was about to post is that upon installing Heroine's Quest, running it in and outside of Steam, running it with and without Steam running, and running it directly via the AGS 3.3.0 "acwin.exe", I cannot reproduce a crash of the game using this build of the plugin. I have reuploaded the build to make the process for the user simpler. Have them extract this file on top of the Heroine's Quest files. They must replace "AGSteam.dll" and "steam_api.dll" with the copies enclosed. Then, when they launch the game, a file "agsteam_debug.log" will be created in the game folder. Please have them report back the contents of that file after the game crash (though, honestly, I really suspect that the game won't crash at all). Thank you, I've invited him to this thread. Strange thing is the debug.log HAS NOT been created. The error message I get is very similar thoufg, only with different numbers. One clue about my problems may be(?) that I am using an old system - XP. Morover, due to registration issues (XP is no longer supported) I have to reinstall the system every 4 months. So, could it be that after last reinstallation I am missing some system files which prevent me from running the game? Yesterday, Ive tried to run another game (not an AGS game) and I got the message that I'm missing d3dx9.dll. Didn't have time to download it yet. The question is, could that be the problem, like an outdated version of DirectX, missing dll files or something? Also, I'm not the techy guy, but all AGS games are built, like, in the same manner, right? Plugins, system requirements needed, etc. So how come this is the only game giving me headaches? This is my first AGS game (and I've played over a hundred of them) that I can't run at all. What's so specific about Heroine's Quest, is it more advanced in certain technical areas? The question is, could that be the problem, like an outdated version of DirectX, missing dll files or something? Also, I'm not the techy guy, but all AGS games are built, like, in the same manner, right? Actually no. For example, it depends on what version of AGS they're using. Among numerous other things, older AGS games tend to run in 16-bit color mode under DirectX 5, whereas newer games (such as Heroine's Quest) run in 32-bit color mode under DirectX 9. I have directX installed, NET framework installed, seriously I can't say what may be the source of the problem on my part. HQ is the only AGS game I have on hd with AGSteam and steam dlls, so I still believe this is the problem. Btw, as I mentioned to you in pm or in the other topic, I was able to run HQ right after it was released, without any problems. Didnt have time to play it though and later I deleted it. Is there any chance the first version of the game, without plugins (I believe it was without them, right?) like it was released first, is still downloadable from some source? Maybe it'll work? This plugin is being built with Visual Studio 2017 with static linkage to the C++ runtime, so it shouldn't require anything that AGS or Steam don't already depend on. Even if it did, then it should crash much sooner, during the phase where the engine attempts to load the DLL (the plugin). What's happening is that the engine is succeeding in loading the plugin, but then for some reason it's accessing some memory address incorrectly. Which is weird, because the only two pointers being dereferenced are a pointer to a static object and a pointer to an object that the Steamworks API has guaranteed (by the successful return of SteamAPI_Init()) to be valid. I am already telling the log to flush after every write, but perhaps I'll try closing it after every write operation. The log should be created, no matter what. Curiouser and curiouser. Please try this version. This will create "agsteam_debug.log" as soon as the "GetClient" function is called, before the AGSteam::Startup function is invoked. The debug log will now print the address of the AGSteamPlugin object and the ISteamUserStats object, which at the very least should verify if one of the pointers is, in fact, a null pointer. This also opens and closes the log file with every write operation, just to fully ensure that the writes are flushed to disk before any crash. SteamAPI_Init() failed. Is Steam running and logged in? that's to confirm that the log is generally working. BTW, that's strange that it failed to init, because I had steam running on background. Maybe I miss something else. If you just launch the EXE Radiant uploaded above then Steam won't detect it as being a Steam game. You can force this by adding a text file called "steam_appid.txt" with only the text "283880" (no quotes) to the same directory as the EXE and plugin. This alerts the Steam API as to which "app" (game) the EXE is when it's being launched from outside of Steam. Or, as you said, you could just install the game via Steam. Thanks for letting me know that it's working up to that point on your end CW. Okay, I actually got this dump to load properly! And, this is totally bizarre, but it says that engine is the NULL pointer. I have no idea what circumstances might lead AGS_EngineStartup to be invoked with a null pointer. 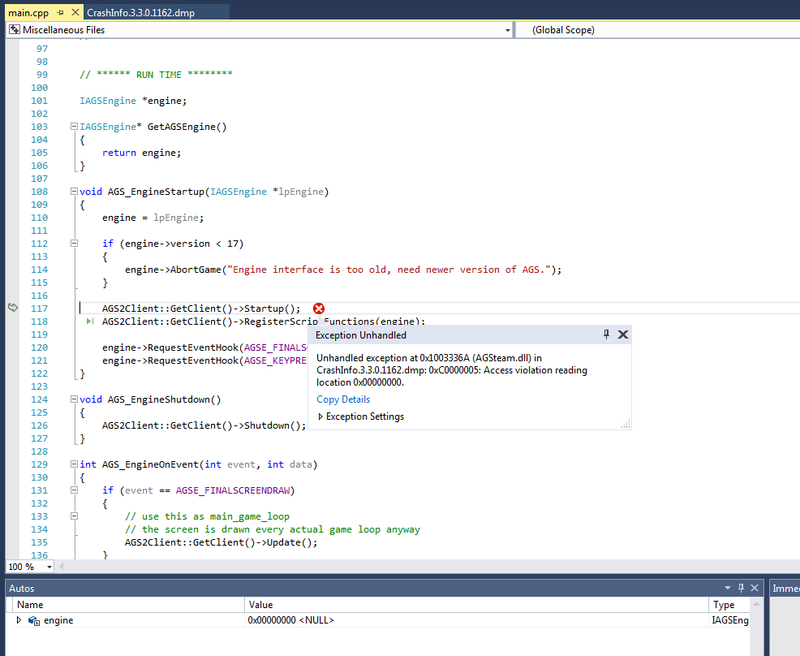 If it's helpful, I can make the debug log start as soon as AGS_EngineStartup is entered, but this seems pretty definitively to indicate where the problem is coming from, which has to do with the engine's invocation of the plugin, and not the actual plugin code itself. Edit: AGSteam-debug-2.zip will create the log immediately after engine has been assigned in AGS_EngineStartup, and will print the value of engine and lpEngine before continuing. The log has not been created again, but here's the dump. General question, could it be that XP as a system is the problem itself? After all, the plugins were created rather recently of what I can read, so they were built specifically for supported OSes. Also, not many players use XP anymore. So maybe they have never been tested for old OS like XP. Does anybody have actual means of testing any of the AGS games using these plugins, under XP? Monkey, the problem with these mini-dumps is that they do not have full memory contents. Which means that every variable can be displayed as zero. You'd need to make AGS write a full dump (but it will be many megs large, or even hungreds of megs). I have a Windows XP on a virtual machine, I'll give it a try. AGSteam-debug-3.zip doesn't even use engine in AGS_EngineStartup. Instead, it operates directly on the parameter lpEngine (which should be the same value, regardless). It attempts to create the debug log as soon as AGS_EngineStartup is entered, before any parameters are inspected or touched. If this crashes, there is one other approach you could try, which is simply running Heroine's Quest with the AGS 3.4.0 engine. To do that, you would need to install (zip archive or installer) AGS 3.4.0, then copy the "acwin.exe" from the AGS folder into the Heroine's Quest folder. Drag and drop "Heroine's Quest.exe" onto "acwin.exe", and it will launch the game using the AGS 3.4.0 engine. The Steam version of Heroine's Quest does run on Windows 7 with the AGS 3.4.0-P4 engine, but I don't have Windows XP installed to test that environment. I'll see if I can get an XP VM running. Well in that case, are the dumps even useful at this point? They were mainly useful to know the exact point and callstack of crash, which could help reproducing it (sometimes). I think Chris Jones did not want to surprise users with 100-300 megs large dump (which would also be difficult to send through the internet in the early years of AGS). You could make another version of the engine which writes full dump, but first make sure that's okay for eMTe to upload huge files . Assuming he'll read this, any hint on how to go about "mak[ing] another version of the engine which writes full dump"? I clearly don't know anything about this, so I don't even have any idea where in the engine code (or solution settings, maybe?) that I would go about doing this. Thanks for the explanation. Oh, and in this case, the dump from AGSteam-debug-2.zip's plugin indicates that the crash occurred at the point that the log file is supposed to be created by the std::ofstream constructor. If the ofstream constructor is actually failing, then presumably I should be able to catch an std::exception, wouldn't you think? I can try and decouple opening the file from the constructor (just initialize the ofstream as an empty object) then put the ofstream.open() call in a try/catch block. I was working on the assumption that the error must be coming from before the ofstream constructor begins, but maybe that's an asinine assumption? I just reproduced same crash on Windows XP. Dump is created, but log was not. So this is system-related actually. I wonder if this may be related to standard library configuration, or something like that. EDIT: also tested with the most recent engine (3.4.1), similar crash at startup, only EIP is different (because engine code has changed). EDIT3: I just thought I've already seen standard C++ library functions crashing before. That happened when one component of program was linking to debug version of std library and another to release version. EDIT2: I am actually thinking we could add a config option to the engine, switching dump type, to avoid the need of different engine builds. Well there are three assemblies to consider here: acwin.exe, AGSteam.dll, and steam_api.dll. acwin.exe and AGSteam.dll both have static linkage to the STL, though they are different versions of the STL. steam_api.dll... well, it could have dynamic or static linkage to the STL, I'm not really certain that it's documented anywhere. Given that Steam is meant to work on a wide range of systems, it seems probable that they would have static linkage, and the file size of steam_api.dll seemingly supports this, but none of that is a guarantee. Regardless of whether steam_api uses static or dynamic linkage though, would different assemblies using their own version of the STL be problematic? If that were the case then I would think steam_api.dll would be unusable. AGSteam is a single assembly which links against steam_api, so I don't see how any part of AGSteam could have the wrong linkage to the STL, if that's what you were suggesting. There is something I did not research fully yet, but when I began using VS2015 I learnt that you may need a specific configuration if you want to target Windows XP. May this be related? The Windows XP platform toolset that's included in Visual Studio is a version of the Windows 7 SDK that was included in Visual Studio 2010, but it uses the current C++ compiler. It also configures project properties to appropriate default values—for example, the specification of a compatible linker for down-level targeting. Only Windows desktop apps that are created by using the Windows XP platform toolset run on Windows XP and Windows Server 2003, but those apps can also run on more recent Windows operating systems. Interesting find, CW. I had done some high-level skimming of MSDN and hadn't come across that particular article (or the enclosed topic). I'll see if I can get something working with that, now that I also have XP installed in a VM. Edit: Unfortunately, still no dice. Even with the "v141_xp" toolset selected, I get the exact same crash before the plugin is able to create the debug log. In this case, the engine and lpEngine pointers are meant to be NULL, as the AGS engine isn't even running. I've tested this on Windows XP, using the "v141_xp" toolset in Visual Studio, and everything appears to be working exactly as expected here. If this also works for you, then my suspicion falls back to the AGS engine failing to load the plugin properly, despite the fact that the crash dump says the DLLs are both loaded. I realized there were some issues with the changes I made converting "AGSteamStub" to "AGS2ClientStub", but even after I corrected those and rebuilt the stub with the "v141_xp" toolchain, the stub still crashes with the exact same error. Based on the fact that "AGSteam-debug.exe" is running perfectly on Windows XP while both the AGSteam plugin and the stub plugin are resulting in a crash, I really feel that this is an error in the way that AGS is loading the plugin, possibly related to the fact that the plugins are built against a different VC++ runtime (despite static linkage, which is meant to prevent this kind of failure). Ok, so if I understand you correctly, AGS3 games using any kind of plugins will no longer run under Windows XP. Is that correct? Given that XP is fifteen years old by now, I'm actually ok with telling people to do an upgrade, since we now know what's causing it. Thank you both for looking into this issue. I don't suppose it would help to build the plugin against the same VC++ runtime as the AGS main executable? I'd say more investigation may be needed. If no plugins were working on Windows XP we would receive reports earlier. That's not hard to test couple of existing plugins too. Then maybe use some dummy plugin to debug the issue, like stub plugin (which is open source?). You might have misunderstood my most recent comments above, but I did actually test this with the stub. The stub does nothing more than register itself with the engine's plugin API. All of the functions are no-ops. But when built with Visual Studio 2017, using the "v141_xp" toolchain, the AGS engine fails to initialize the stub with the exact same error message. I don't think it's "any kind of plugins", but I think it must have something to do with the VC++ runtime and the way the AGS engine is loading the plugins. My suspicion is that the engine is somehow expecting the plugin to have the same VC++ runtime libraries as it uses itself. I don't know if this is a limitation of the engine or the way it invokes the plugin functions, but it has always been my understanding that external libraries should be allowed to link against a different C++ runtime, so long as that linked runtime is available (which is the case, due to static linkage). I can confirm that the issue is related to the VC++ runtime. Building the stub with VS2008 makes the game playable on Windows XP without Steam achievements. The AGSteam project itself is not currently compatible with VS2008, but I can see about adding the same compatibility measures used by the stub. The stub download links have been built with VS2008 and work on Windows XP with AGS 3.3.0 engine. It also loads with the AGS 3.4.0-p4 engine, but the mouse goes absolutely insane and is unusable. Thank you all for the efforts. So, where does it leave me, because the talk got too technical? Is it doable to make HQ working under XP, I mean of course it's doable, but is the workload/time/purpose ratio acceptable, like adding few lines of code or is it an absolute waste of time? Especially with me being the only user reporting the issue. Okay, so this build of AGSteam (built using VS2008) loads on WinXP without crashing, but I don't seem to be getting the Steam API to initialize. This is a release build, not a debug build, so it doesn't include any debug info about what result is returned by the call to initialize Steam. Effectively, it's functioning the same way as the stub at the moment, which is to say that the game is playable, but you won't get Steam achievements. Technical discussion: I think there may have been some misunderstanding on my part regarding how C++ assemblies with differing ABIs can communicate. And while the core functions are all implemented as free functions, it's possible that they are being mangled in some unexpected way between the different VS versions, or that there is some other ABI incompatibility (probably the changes in the STL would make the ABIs incompatible, I might think). Based on this thread on Stack Overflow, I have some hope that perhaps forcing the DLL exports to use the C ABI instead could solve the runtime issues, though I'm honestly not sure about this. I'll look into porting the stub to the C ABI and see if I can get it to load that way when compiled from VS2017. If I can't, then I'll probably just call it all a wash and only maintain project files for AGSteam (etc.) that match the current AGS project files' VS version. Edit: Unfortunately, even with every single free function marked as extern "C", the AGS engine is still crashing when trying to load the VS2017 plugin from WinXP. I even went as far as wrapping every single entire file in an extern "C" block (sans #include lines), to absolutely no avail. I've managed to track this down to the use of "static" variables inside functions. STL, free, and class functions are all working, until it encounters a static definition inside a function. Using the more traditional approach of static struct/class members with external storage defined in a .cpp file works. It will take a short time to port the code, but it seems that I should be able to get this fully working on XP. Huh... Actually, I think that the plugin I linked above is initializing the Steam API, it's just not showing the Steam Overlay. Which is also the behavior I'm now getting with the VS2017 plugin. I'll investigate the overlay issue, but if nothing turns up soon then I'll just push up a new build with the fixed VS2017 code. Edit: The Steam overlay works with the 3.4.1-b7 engine on Windows XP under D3D9 and OpenGL, but not software renderer. Oh, and it crashes with a segfault when I close the window via the red 'X'. Not sure if that's related to the plugin, nor if it would cause crashes during playing. Oh boy. Aside from the above, there appears to be an issue with your latest version of the Steam plugin (the one from the quoted post). Specifically, it prevents the game from accepting keyboard input, when ran from Steam. If I log out from Steam and run the game directly from Windows, it works normally. Earlier versions of the plugin did not have this issue. I can confirm this bug - I've updated to the latest version of the plugin, and people are reporting keyboard issues. I can't reproduce it myself though. What i have to do to use this plugins? There are 4 .dll files. My game will not have achievements or cards, just i want put in Steam the game. What should do i? I forget the answer of other user about . I don't have to use the plugin to sell the game in Steam. Hi Monkey, I was wondering if you had some time to look into this? I would like to upgrade to the newest version of AGS2client but I'm stuck with the old one because of this keyboard bug. Thank you for your time! Hi, sorry about that. It was a breaking change I introduced due to my own misunderstanding. Dave actually had asked me recently about the same, and I realized what the issue was. I'm doing some refactoring of the code currently, but I'll push up a new build with the fix. Edit: Fixed build v3.3 should be available via Github. There's no binary for the Linux builds yet (but the Code::Blocks project for Linux is provided; never got around to authoring a Makefile from scratch). Ok, that appears to fix the issue, thank you. I'll be using the disjoint version for now, to keep the game in sync with the Linux build. A windows XP user reports that using the previous version of the plugin fails with an unresolved import error, whereas the current version aborts with "An exception 0xC0000005 occurred in ACWIN.EXE at EIP = 0x100011BC ; program pointer is -23, ACI version 3.3.0.1162, gtags (0,0)" We can probably get a dump file if you think that helps. Could someone please advice me on how to add the Steam plugin to an OSX game in xcode? Re: ENGINE PLUGIN: AGSteam v3.4 - Mac OS X! The latest version 3.4 now includes Mac OS X ".dylib" files! OS X support is in beta as I don't (currently/yet) have a means to test it myself with real games. However, I don't foresee issues as it is built using Code::Blocks in a nearly identical way to the Linux ".so" libraries. The Windows and Linux builds are also now bundled with the appropriate version of the "steam_api". Edit: Was able to test this over the last couple of days and everything seems to be working. I've also written a Makefile! I will push up the Makefile to the git repo and update the Mac download link ("libagsteam.dylib", blast it!). Not sure if I'm doing something wrong here, but I'm using v3.4 (Windows) with the "unified" dll. I went through all my game scripts and changed all instances of AGSteam. to AGS2Client. I also changed all the wrapped code from #ifdef AGSteam_VERSION to #ifdef AGS2Client_VERSION. It still crashes if I wrap each of the above four lines individually. An internal error has occurred. Please note down the following information.. I updated all script instances of AGSteam. to AGS2Client. and it worked fine when they were AGSSteam. instances. You have either missing opening quotemark or unnecessary ending quotemark at the second parameter. Damn, how the hell did I not notice that? It's one of those days, I guess. Thanks, CW. Okay, that's solved both issues after I rebuilt all the files. I'm getting a few reports from beta testers that with AGSSteam v3.4, there's an issue with the Steam overlay (Shift + TAB), which I have also observed myself. While the Steam Overlay is active, if you click anywhere (for example clicking on your friends list or looking up guides etc.) the game reacts as if you had clicked in-game with whatever icon was active at whatever placement it had when you opened the Steam Overlay. For example, if you have the walk icon selected, EGO starts moving to the spot where the cursor was pointing in the game. If you have the eye icon selected, EGO comments on whatever the cursor is pointing at behind the Overlay. This happens with both the Open GL and Direct3D 9 drivers. (With the Software renderer, the Steam overlay does not appear at all when ALT + TAB is pressed). Has anyone here released a game on Steam with AGSteam v3.4 yet and had it functioning stably? My beta testers keep getting "Null String Referenced" fatal crashes on seemingly random achievements when SetAchievementAchieved is called. The same code didn't crash the game in previous versions, and I can't see anything in the AGS code or in my Steamworks stats/achievements settings that should cause this crash. Sometimes I'll recompile the game and tweak some unrelated AGS code (and not edit any of the achievements or stats on the Steamworks side), then push the update to Steam, and suddenly the "Null String Referenced" fatal crash stops occurring for that achievement, but starts happening for other achievements. Been trying to solve the issue for a few weeks now, but it seems v3.4 is possibly unstable and I may need to return to an older version. Can you shed any light ton this, Monkey? The dll files we used for Unavowed are dated May 26th, 2018 and we've had no problems on PC. We've had issues with achievements not being unlocked on Mac, but nothing that crashed the game. AGD2, did you make any progress with this? Manage to find out what was causing the issues? If anyone has a link to the dll files Dave used (May 26th 2018) I'd appreciate being pointed in the right direction. Github confuses me! Yeah, it turns out that I needed to have all of the achievements referenced in my game code also set up in the Steamworks back-end. From what I could see, the AGSteam documentation mentioned nothing about this, so I was adding the achievements to Steamworks gradually, as time permitted. I had about 34 of 45 achievements added to Steamworks. But when I added them all, the crashes stopped happening. So, it's not a bug with the plug-in. Just something to be aware of.